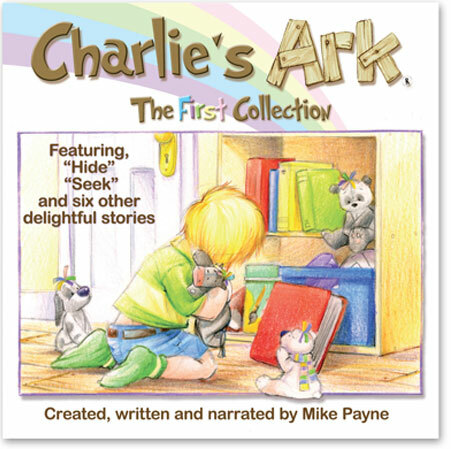 Charlie’s Ark is a about a five year old boy and his toy-box. His toy-box is in the shape of an ark, in which he keeps his animals that all come to life when he whispers the magic “Wordspell”. A rainbow is always associated with an ark and that is why all the animals that “live” in the ark have rainbow top-knots, manes and tails. 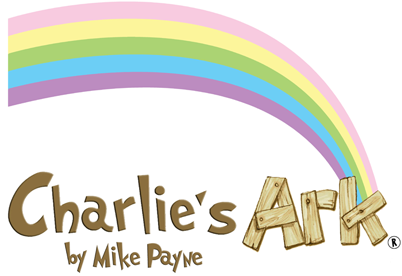 Mike has written some 25 stories of Charlie, his animals and all the magical adventures they have together. He plays all day with his favourite toy. It’s not a car and it’s not a plane. It’s not toy soldiers and it’s not a train. The very biggest and best secret. There’s just you and me, so I’ll tell you now. I’ll tell you why, and where and how. This secret is between the two of us. It’s nothing horrid and it’s nothing bad. They must’ve seen him with this toy. The boat’s full of animals he’s had for years. A zebra, a pig and a duck that’s fat. For if I list them here, you’ll forget. All have names like Tumble, you see. Charlie’s Ark and who told you so. 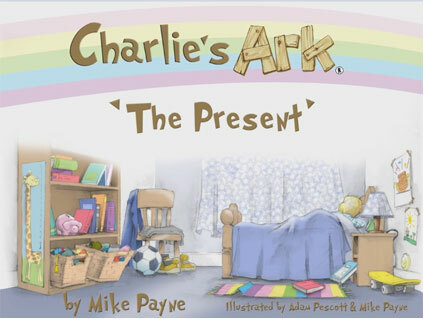 Created and written by award winning Illustrator Mike Payne and Illustrated by Adam Pescott & Mike Payne, Charlie’s Ark transcends generations with its evocative storylines and Mike’s trademark emotive illustrations. 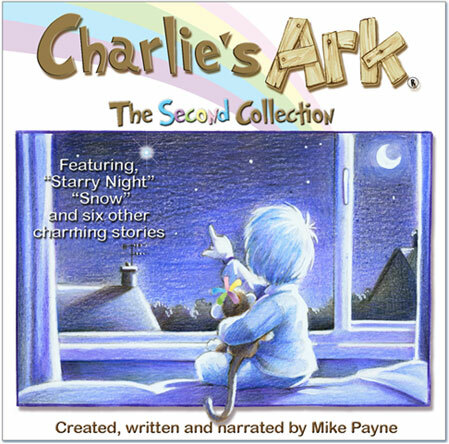 Two audio-books, “Charlie’s Ark – The First Collection” and “Charlie’s Ark – The Second Collection” are available from iTunes, Play.com and other suppliers. – are just some of the reactions of happy parents. 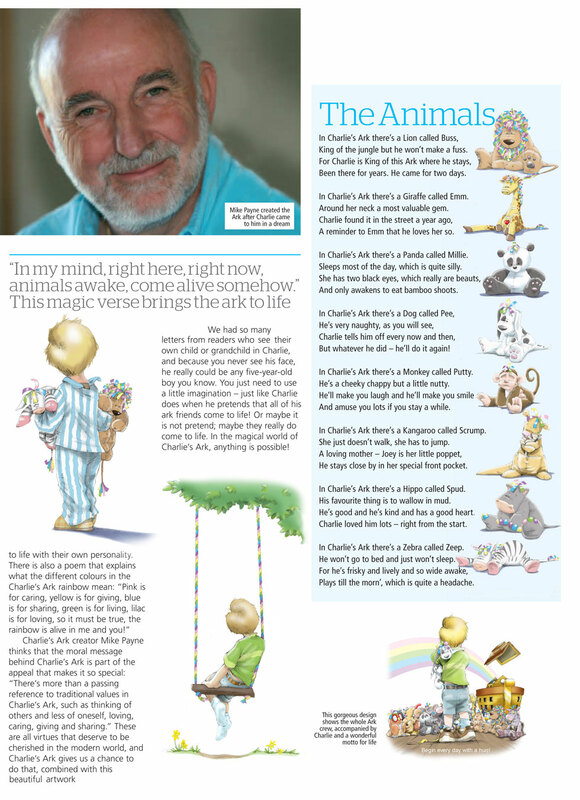 The power and magnetism of Charlie’s Ark stories can perhaps best be illustrated by the in-car format, where the incidence of ‘Are we there yet?’ kids’ boredom threshold has been virtually eliminated! 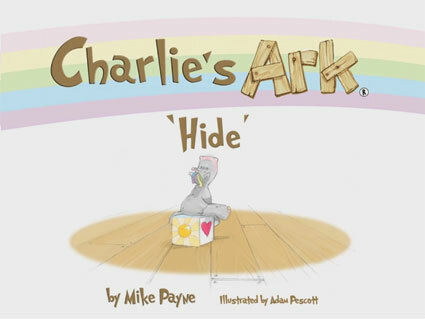 To get a flavour of Charlie’s Ark here are a two videos of the stories “The Present” and “Hide”. Enjoy and if it touches the spot please do “Like” it. 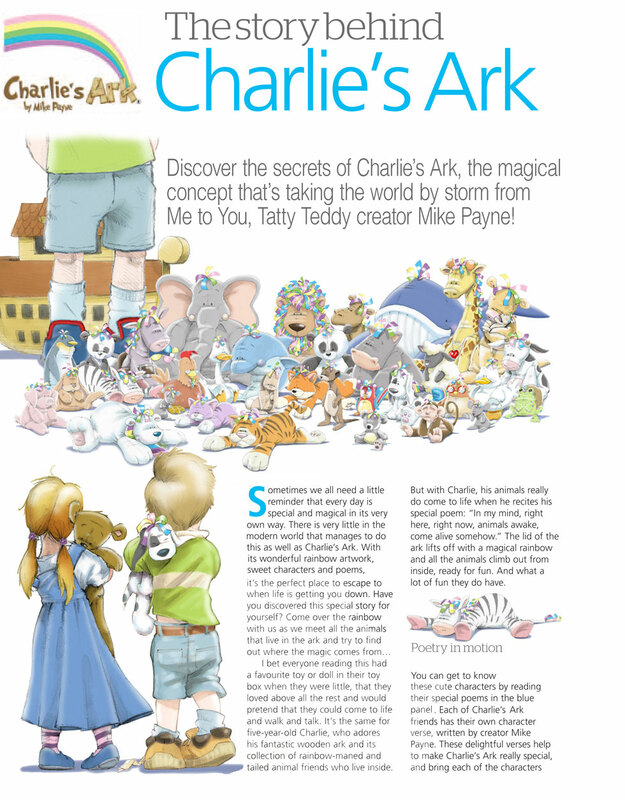 The Mike Payne Studio had a quick chat with the five-year-old star of the adorable Charlie’s Ark, by Tatty Teddy creator Mike Payne. Hi Charlie, nice to meet you. Where do you most like to play? I like to play in the loft room at the very top of our house. Mummy and daddy made a playroom out of some loft space and that’s where my little sister, Sally, and I keep all our toys. We’ve got some toys in our bedrooms, but what’s brilliant is that we can make a mess in the loft room and it doesn’t matter! What do you think is the best thing about being five years old? I like waking up and having lots of time to play with my animals. I like to see the sun shining oh so bright through my bedroom that’s cool. My teacher is Miss Clarke and she’s really nice. We’re doing painting today. Mummy says I’ll make a lot more friends there, so that’s good isn’t it? They have fish fingers at school and I really like them! In your ark, do you have a favourite animal, or one that you like to play with the most? I do have a favourite animal but I wouldn’t want to say ‘cos I don’t want to hurt the other animals feelings. I try not to have a favourite but you can’t help it can you? I like cuddling Pee the Dog and Putty the Monkey is a really good friend. What’s the best adventure you’ve ever been on, or are there just too many to talk about? There’s been lots and lots. It’s hard to say what the bestest one was but I think it was the time mummy and daddy took me and Sal to the theme park. I don’t know where it was but we drove a long way to get there. When we arrived we had a fab time doing rides on things and the bumper cars were brilliant! Dad was with me in the red one and mummy was with Sal in the blue one. We kept bumping each other and Sal got the giggles and couldn’t stop, which made us all laugh lots. The best bit was when we drove into the Safari park bit and we drove around among lots of animals. There were monkeys, giraffes, lions, tigers – all sorts. We then went on a boat and saw seals and otters and even some hippos. It reminded me how precious my animals are in my ark and made me miss them. Animals are precious aren’t they? What’s it like having a little sister? Do you enjoy playing together? It’s alright. We play quite a lot. When we are away from the loft room we play in the garden. We like to play chase and there’s always a ball handy to catch or kick! I look after her ‘cos I’m older than her and she’s a girl. She likes different things to me. I love my animals that I keep in my ark toy box. Sal doesn’t play with them, unless I tell her she can, because they’re mine. She’s nearly always playing with her teddy bear. It doesn’t have a name so we all call it Sally’s Bear! Sal also plays with all her dolls…Yuuuuck! I think that’s all we have time for now. It’s been fun talking to you, thank you Charlie! Thank you too! Can I go now? I want to go to my ark and play with my animals!